will make a great gift for anyone at any age. 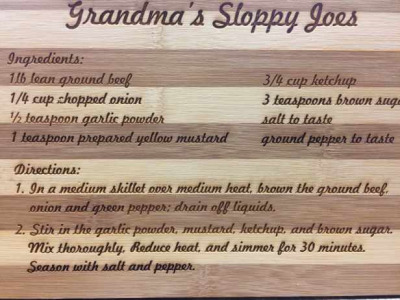 Your creativity can flow with ideas of heartfelt words, expressions, and thankfulness on your engraved butcher block cutting board. These boards are professionally laser engraved to leave a crisp precision impression. The engraved butcher block cutting board will last for years and years of usage. You can cut veggies and cheeses for a football game to Steak or Fish for a outdoor cookout tailgate. 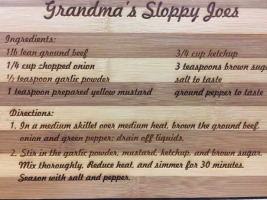 Your engraved butcher block cutting board can be beautifully displayed on one side to be hung in your kitchen as a piece of art and used as a cutting board on side that is not engraved. Your Custom lased engraved cutting board comes with a ring for mounting if you choose. sizes are roughly 8" x 12" and 1/2" thick as one solid piece of engraved art. Your engraved butcher block cutting board will be created same day or you can overnight for Next Day shipping.